With his heartfelt tribute to Elvis Presley, Chris MacDonald will bring back the memories of the King of Rock-n-Roll in a truly dynamic performance complete with costumes, singers and a high-energy concert band, August 14th at the Peabody Hotel in Memphis. This special Elvis week memorial tribute concert will be a celebration of the life and music of one of the greatest entertainers and pop culture icons of our time. 35 years ago (August 16, 1977) the world lost one of the greatest entertainers and pop culture icons of our time. Are you still lonesome for the energy, charisma and incredible voice of one of the most enduring icons of our pop culture? Then come celebrate the life and music of Elvis Presley, when tribute artist Chris MacDonald presents Memories of Elvis in Concert August 14th at 3pm at the Peabody Hotel in Memphis during Elvis week. Elvis Presley, recognized by TIME magazine as the "Artist of the Century," has sold more records than any other artist or group in the history of modern music. Even after death, his image and music continue to be loved and celebrated throughout the world. July 5, 2004 was established as the official 50th Birthday of Rock-n-roll commemorating Sun Records release of Elvis Presley’s song “That’s all right Mama”. With recent number ones on Billboard and Great Britain’s charts, new releases of master recordings, film and television licensing, and a hologram in the works, Elvis once again proves he is gone, but not forgotten. 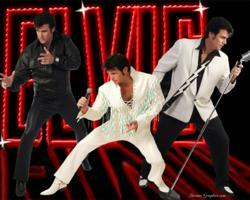 Keeping the memory alive at countless venues throughout the country Chris MacDonald lovingly brings back the magic of the “King of Rock-n-Roll” with his tribute Memories of Elvis in Concert. Chris’s show is not an overdone impersonation. It is a natural heartfelt tribute to the King of Rock-n-roll. Adding to the authenticity of his tribute, Chris has the honor of being the only tribute artist hired by Elvis Presley Enterprises to perform at Graceland's Heartbreak Hotel for 7 consecutive years. An energetic and experienced entertainer, MacDonald has also performed in venues throughout the country including Vegas, New York, and Miami and with the famous LEGENDS IN CONCERT stage productions in Branson, MO, and at the Hard Rock Hotel and Casino. He has also performed in Concert with Elvis Presley’s original back up group the Jordanaires and D.J Fontana, Elvis' original drummer. Not only is the charismatic MacDonald superb in performing as Elvis, this versatile performer has an extensive repertoire spanning from the 50's through today including contemporary country music in addition to some of his own original music. MacDonald’s solid vocals have also earned him Broward County’s Florida Country Music Association’s (FCMA) Male Vocalist of the Year award and a feature track on The Deuces Wild compilation CD which received the FCMA Best CD of the Year award. Chris has a new original country CD that was recorded in Nashville entitled No Misconception. All songs on the CD were recorded with harmony vocals. provided by the legendary Jordanaires. The songs are available for digital downloads on iTunes or his website chriselvis.com. Also just released this year is a full live double CD recording of "Memories of Elvis Live in Concert" also available on iTunes and Amazon. This newly updated national touring production, the show will include production numbers with costume changes and songs representing the different stages of Elvis's incredible career including the 1950's, the Movies, the 1968 Comeback and the 1970's White Fringe Vegas Concerts. With his heartfelt tribute to Elvis Presley, Chris MacDonald will bring back the memories of the King of Rock-n-Roll in a truly dynamic performance complete with costumes, singers and a high-energy concert band. Tickets are on sale now for this special Elvis week memorial tribute concert celebrating the life and music of one of the greatest entertainers and pop culture icons of our time.